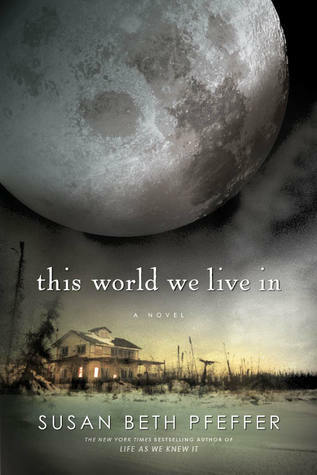 It’s been a year since the asteroid hit the moon, and Miranda and her family are still struggling to survive in the ruins of their small Pennsylvania town. When Miranda’s father, his wife, their baby, and Alex and Julie Morales (from The Dead and the Gone) show up at the door, the group must make plans for the future. They know the governmental food deliveries won’t continue forever, and with ten people, there’s no way their stored food will last long. However, finding a safe place to go is a challenge. There are rumors of safe cities, for governmental officials and other important people, but no one is sure how or where to find them. As they search for a workable solution, the weather grows increasingly violent; they don’t have much time. Will they make it to safety? 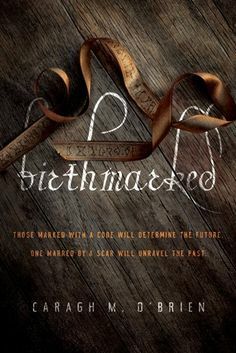 The final book in the Last Survivors trilogy connects the stories of Alex and Julie, from the second book, with Miranda and her family’s. There are no good answers to the climate change and food shortages, but the book manages to strike a balance between bleak hopelessness and unrealistic solutions. 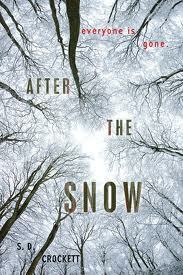 In short, Susan Beth Pfeffer continues the tone of the previous two books, giving us a chillingly accurate-feeling story about the end of the world. If you don’t like the zombie apocalypse stories because you don’t think it would ever happen, this trilogy will give you the end-of-the-world creepiness that feels realer than real. It’s scarier than some books for adults, even. I couldn’t put it down, and I bet you won’t be able to, either. Pfeffer, Susan Beth. This World We Live In. Harcourt: Boston, 2010. 239 pp. Ages 15 and up. Alex was behind the counter at Joey’s Pizza when the asteroid struck the moon. The impact knocked it out of orbit, and set into action a chain of catastrophic events. Tsunamis, earthquakes, and floods, to start. Then the volcanic eruptions and climate change-the ash from the volcanoes obscures the sun and turns July into January. The natural disasters exacerbate food shortages, making people more likely to succumb to the flu epidemic, or other diseases making their way through the population at alarming rates. Worse still, Alex doesn’t know where his parents are. His father was attending a funeral in Puerto Rico when the asteroid hit, and his mother was working at the hospital in Queens, but no one has heard from them since. This leaves 17-year-old Alex in charge of his two younger sisters, Bri and Julie. Overnight, Alex must decide how to find food, protect his sisters from the brutal new reality they are facing, and make a plan for the future: there’s no telling if scientists will be able to fix the moon’s orbit. 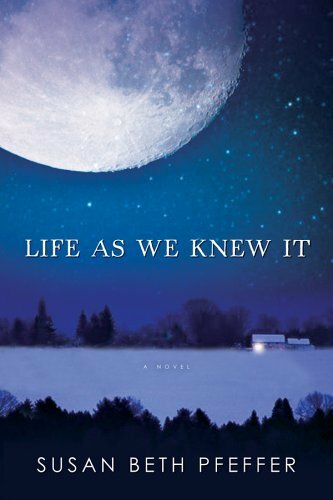 This gripping novel is the second in a trilogy; Life as We Knew It told the story from Miranda’s perspective-a young woman living in a small Pennsylvania town. 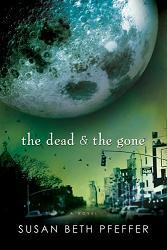 The Dead and the Gone is set in New York City, but covers the same asteroid strike. Instead of a first-person diary format like Miranda’s, Alex’s story is told in third-person, which I preferred to the journaling-style. While I loved the first book in the series, I found The Dead and the Gone to be even more gripping and terrifying. I’m no stranger to end-of-the-world books; you might even say I have a morbid fascination with How Things End. However, I can honestly say that this is the single creepiest apocalypse story I’ve ever read-adult or young adult fiction-and it is because of its plausibility. The entire time while I was reading, all I could think was: “Hey, this could really happen.” That thought was enough to keep me hooked. You’ll love it-if it doesn’t scare you to bits, first. Oh! A mysterious side note-did you know that Susan Beth Pfeffer is a pseudonym? The real author of this series is Micky Spillane-you can read all about it on the author’s website. Pfeffer, Susan Beth. The Dead and the Gone. Harcourt: New York, 2008. 321 pp. Ages 15 and up. “I know all those astronomers I’d watched an hour earlier on CNN can explain just what happened and how and why and they’ll be explaining on CNN tonight and tomorrow and I guess until the next big story happens. I know I can’t explain, because I don’t really know what happened and I sure don’t know why. When a meteor crashes into the moon, it sets off a series of terrifying calamities: tsunamis, volcanic eruptions, and climate changes. Panicked citizens rush into stores and get in fights over canned goods. Gas prices skyrocket. Electric power service becomes erratic and soon ceases altogether. As for water, the lucky ones are those that have their own wells, but even they risk running dry; the climate changes mean unpredictable rain showers. When it does rain, the storms are of frightening magnitude. Sixteen-year-old Miranda records it all in her diary. She lives in Pennsylvania with her mother and two brothers. Together, they try to survive the end of the world as they knew it. They watch their dwindling supplies of canned goods, chop firewood for their stove, and venture out only to the post office, to wait anxiously for news of loved ones. The lists of the dead grow longer and longer; many people starve or freeze to death, and those that survive are susceptible, in their weakened states, to the flu or other diseases. What’s a teenager to do when it looks like the end of the world? I’ve read a lot of books about the future; I’ll admit, I have a weak spot for Worst Case Scenarios. The earth runs out of oil? I totally want to read about it. Zombie apocalypse? The only way I’ll be prepared is by figuring out what the characters in the book did, right? Anyway, I consider myself reasonably well-qualified to judge these kinds of books. Life as We Knew it is one of the best I’ve read, for several reasons. First, it’s one of the scariest because it seems to be the most likely Way The World Ends. An asteroid hits and the dust from the impact and the ash from volcanic activity obscure the sun and cause dramatic climate changes. Secondly, the diary format really captures Miranda’s anxiety, frustration, and cabin fever as her world is reduced to the size of a single room: the only room heated by their woodstove. And thirdly, the ending isn’t controved, no deus ex machina solutions that enable scientists to push the moon back into place and restore order. I can’t tell you, of course, but you can trust Susan Pfeffer: she won’t let you down with an unrealistic ending, but she won’t terrify you with nothing but destruction, either. Miranda’s voice is realistic, and her observations of the world around her are sharp and fascinating. I was horrified and captivated while reading her entries about her brothers, after she realizes that her mother might have to choose which of the three children to continue feeding, should the resources get too low. This book will have you stocking up on canned goods and batteries, for sure. If you’re looking for a chilling book to escape the miserable summer heat, this one is a great place to start. Pfeffer, Susan. Life as We Knew It. Scholastic: New York, 2006. 337 pp. Ages 13 and up. If this book sounds great, you’re in luck! There are two more in the series: The Dead and the Gone, and This World We Live In.